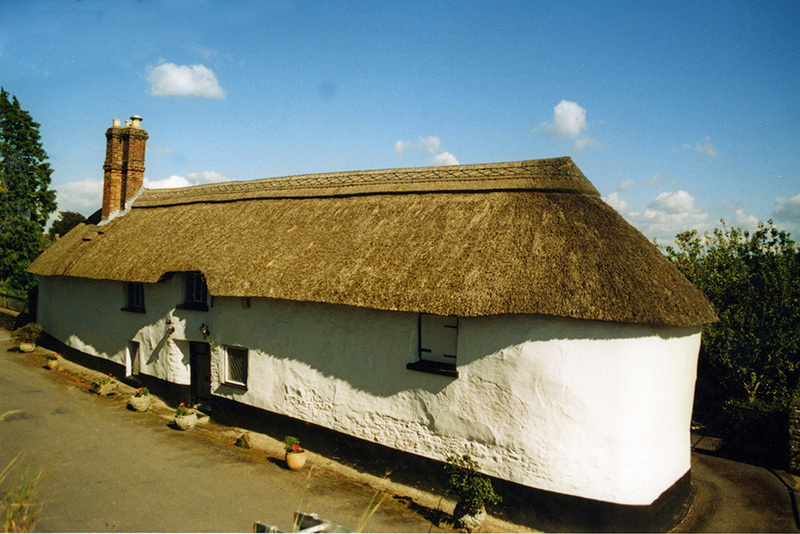 All standard coatwork needs a covering at it’s apex; to protect the final line of fixings and top course of thatch. 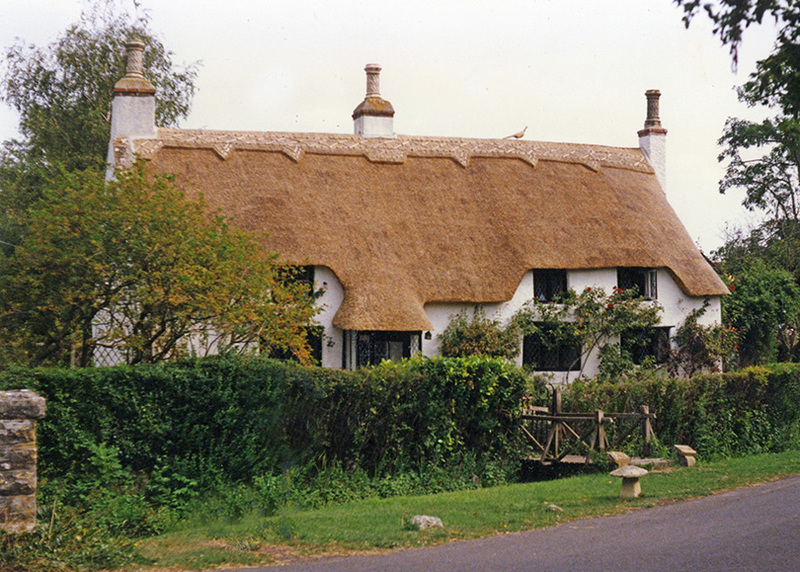 Over time, various ways of achieving this have been developed… The vast majority of standard thatched roofs, in Britain, are now topped with a ridge; of either cereal straw or sedge grass. 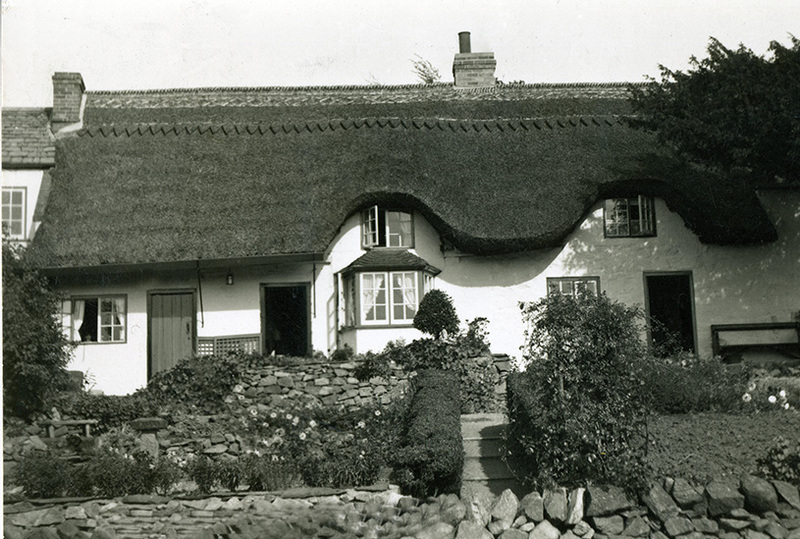 As will be seen, this was not always such a popular finish, to a thatched roof. 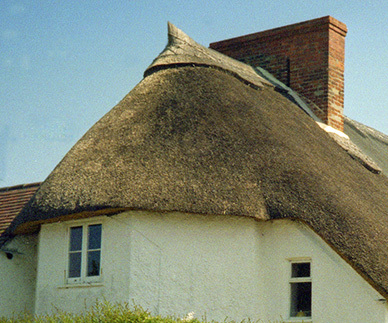 This type of ridge needs renewing throughout a thatch’s life; as well as finishing a new roof; the methods for completing either being the same. Renewing existing ridges, gives much work to the thatcher. Both simple and ornate ridges last around the same length of time… A ridge comes to the end of it’s useful life, when the wooden fixings holding it on, decay. What lies underneath those fixings, makes little difference. The cost of ridging lies mainly in the labour to create it. A thatcher can often cover around 25 feet (7.5m. ), of a simple ridge, in a day… A really ornate job, could take five times as long. 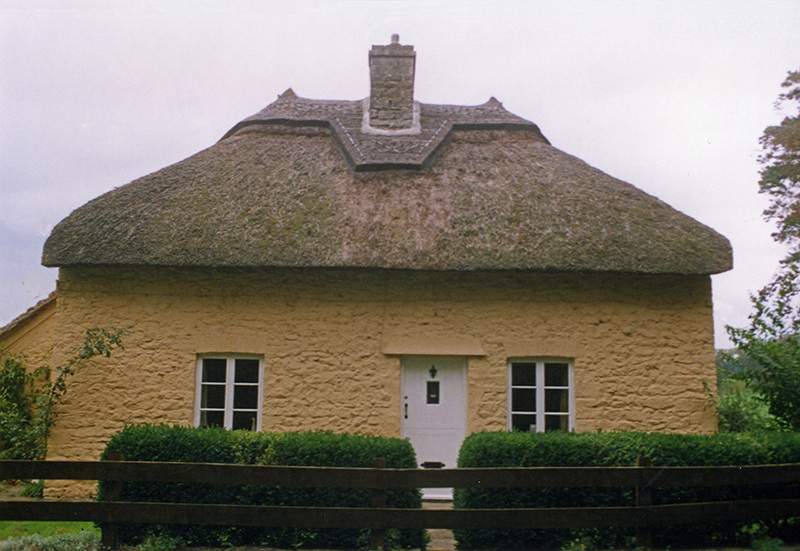 The upper thatch is topped with a butts up flush ridge, which forms a seamless join with the coatwork. 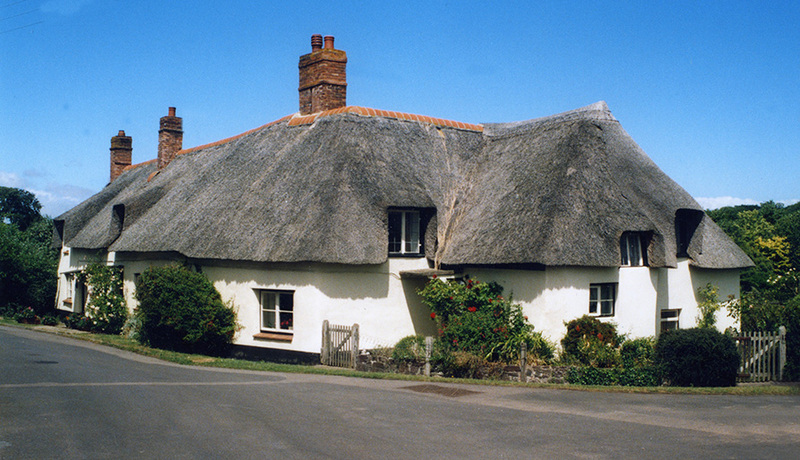 The lower roof, by a wrap over block ridge, immaculately shaped into a pleasing design… Top thatch; at Chideock in Dorset. 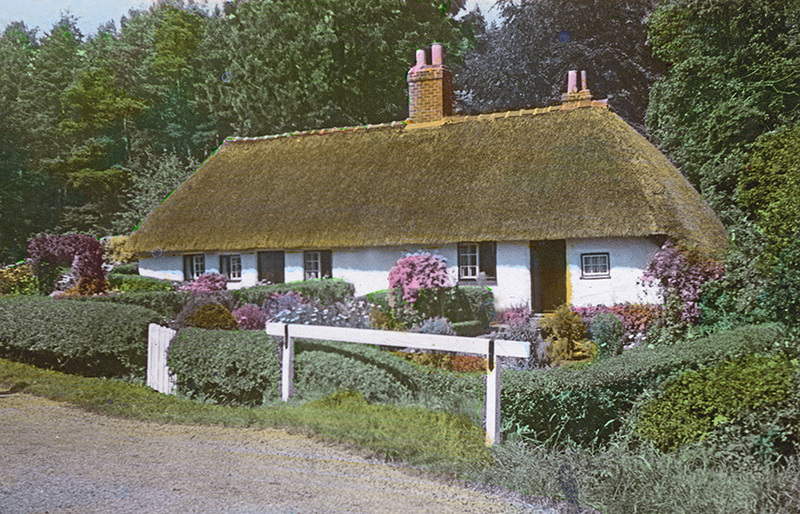 Lower thatch; at Swallowfield in Berkshire. The flush finish, consists of shaving down the ridge, at the bottom; joining invisibly with the coatwork. The block finish is created, when the thatcher fixes an extra layer of material, before the top ridge section is fixed; known as a Skirt. The thatcher shapes the skirt, to a rough outline of the finished design; which is eventually cut from it. 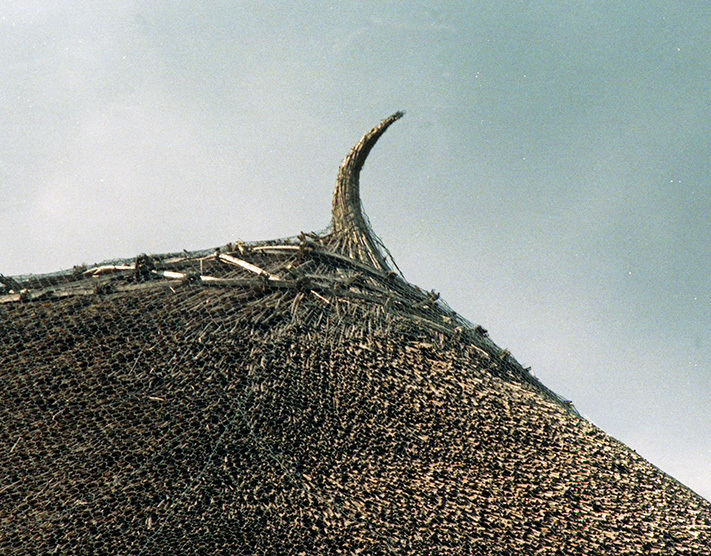 All these types of ridging also use thatching spars, usually in great numbers; and liggers. 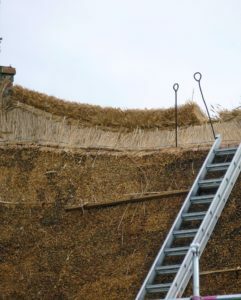 The liggers hold the straw or grass in place and twisted spars hold down the liggers… A thatcher typically spars the liggers into place, every 4 inches (100 mm) or so, along their length. Untwisted spars also double up as a means of decoration, as Cross Spars on most ridges. The thatcher below is sparring down one side, of a butts up flush ridge; yet to be filled with cross spars and trimmed. 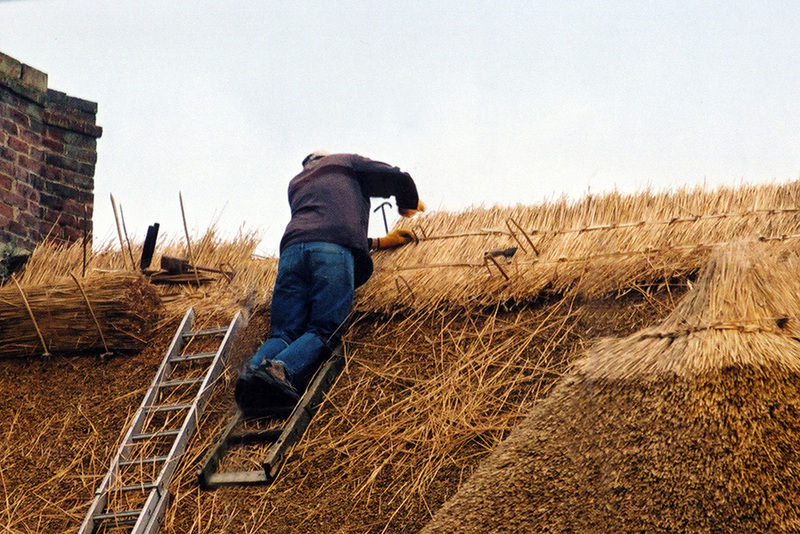 With this type, the base layer or skirt is fixed first… To form this skirt, the thatcher spars on a layer of material, around half the thickness of a normal coatwork course; at a suitable distance down the roof. 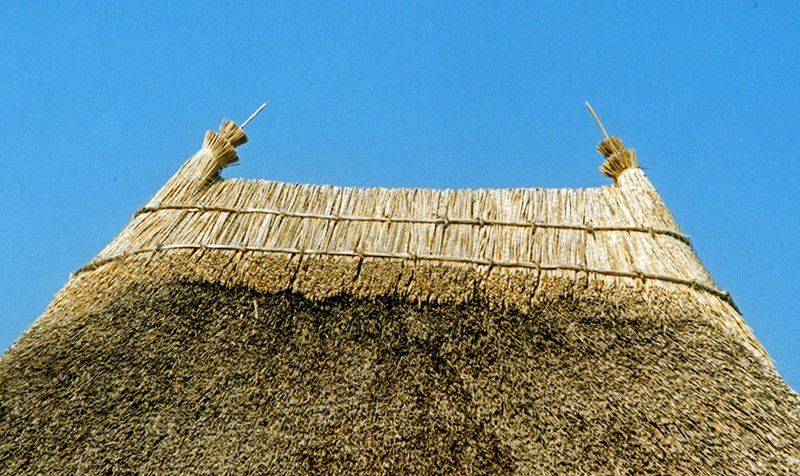 If the ridge is wider than the material used, another layer is fixed, to fill in the ridge up to the apex of the roof. 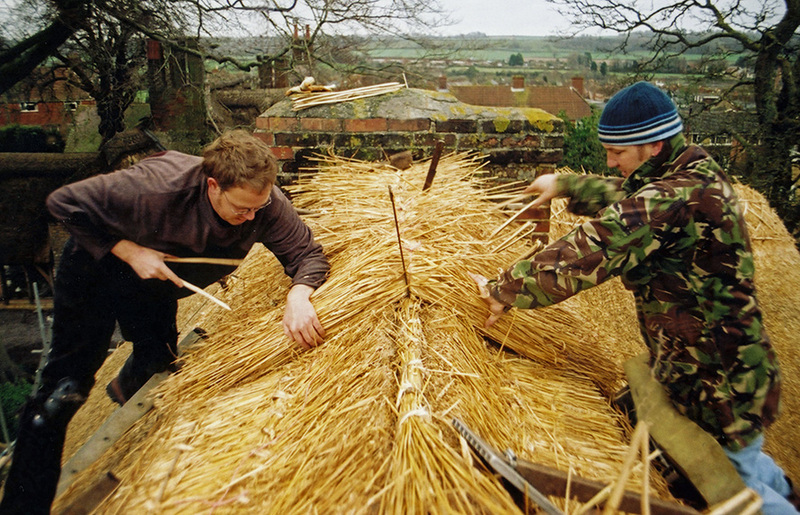 The third ridge roll is now also fixed, giving a firm level base for the top ridging; either butts up or wrap over… The ridge is normally cut to shape, when this top layer has been added and the spar work has been completed. A very sharp knife is normally used, for this skilful cutting. Usually no skirt is required for this finish…This type is also known as a Shear Out ridge. As a shearing hook is often used; to trim the edge smoothly into the top of the coatwork, when the ridge is complete… It is good working practice that the join, between the ridge and coatwork should be invisible. 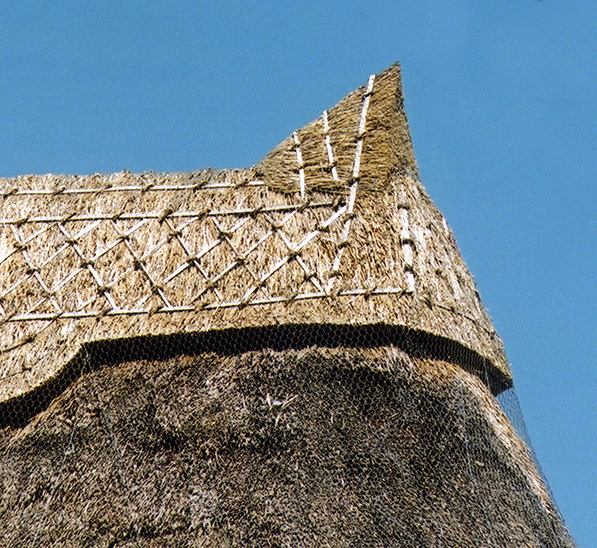 Typically the ridge is trimmed, from under the lowest ligger to the top edge of the coatwork face. 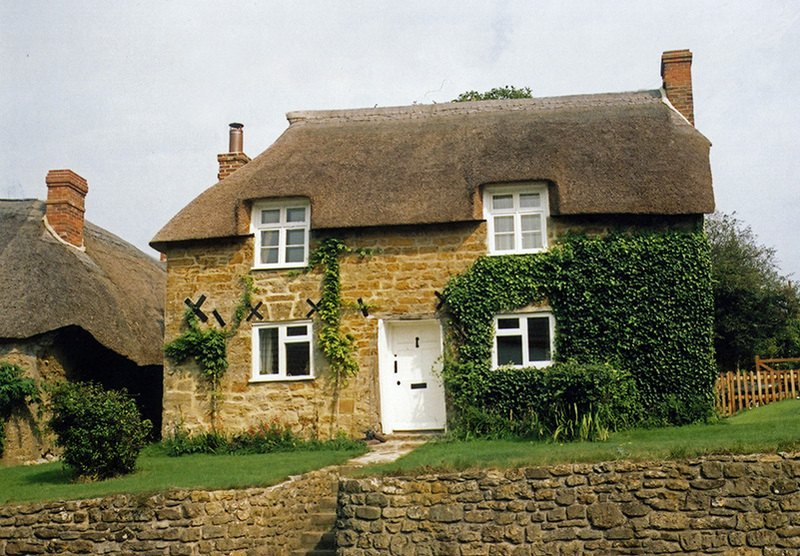 Wrapping… Two thatchers can work well together whilst completing a wrap over ridge. The photo shows the ridge roll, with the knuckled base layer in place, on either side. The top wrapped layer is then laid and fixed down over these. The top is given a twisted effect, by taking a hand full of material, splitting it, as with a wrap over ridge; then twisting it around a finger. The knots or bobbins, are then threaded on a spar. An end for the knots, which seems unique to Devon, can be created by tying a double handful of material just under the ears… Being completed, by plating a few stalks at a time, one over another… When trimmed a small pineapple effect is created, giving an attractive finish. 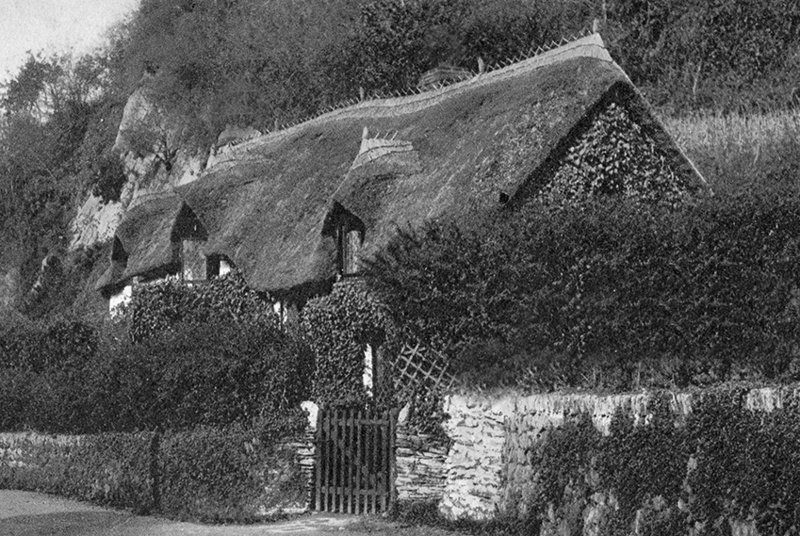 South Devon roping… Only this area seems to have devised a neat plaited end for rope top riding… When done well, as in the right ridge at Kingsteignton; a very attractive topping can be created, either with a flush or ornate finish. Old roping… Rope top ridges were once seen over a great part of Wales and to a lesser extent, in neighbouring parts of England. 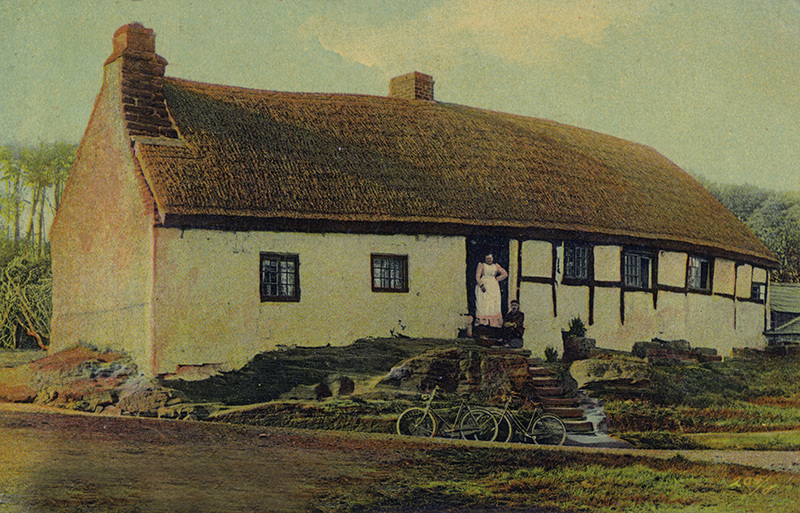 The heavily repaired top thatch, from Dyserth in Denbighshire, is very typical. 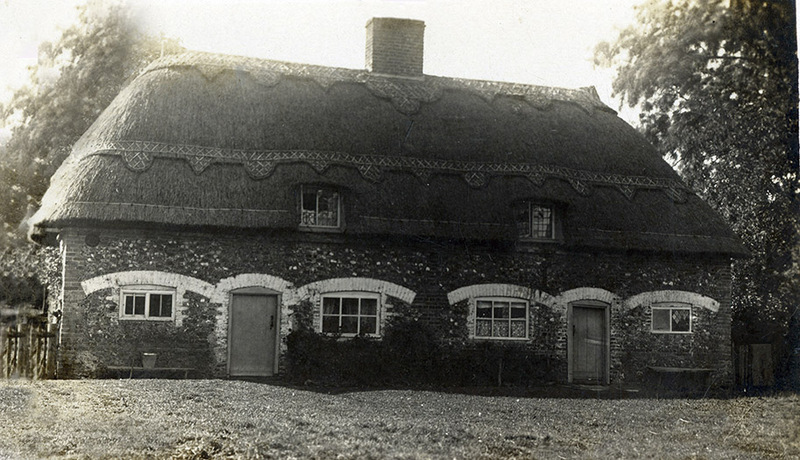 The Leicestershire cottage, at Newton Lindford, also shows this type of ridge. 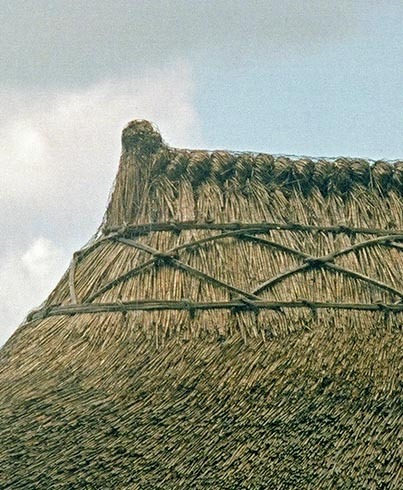 Along with what seems to be the original design, for the ornamental block ridge… This ‘saw tooth’ pattern is often seen on old images of thatch; dating well back into the nineteenth century. But these were always few in number; compared with flush finished ridges. 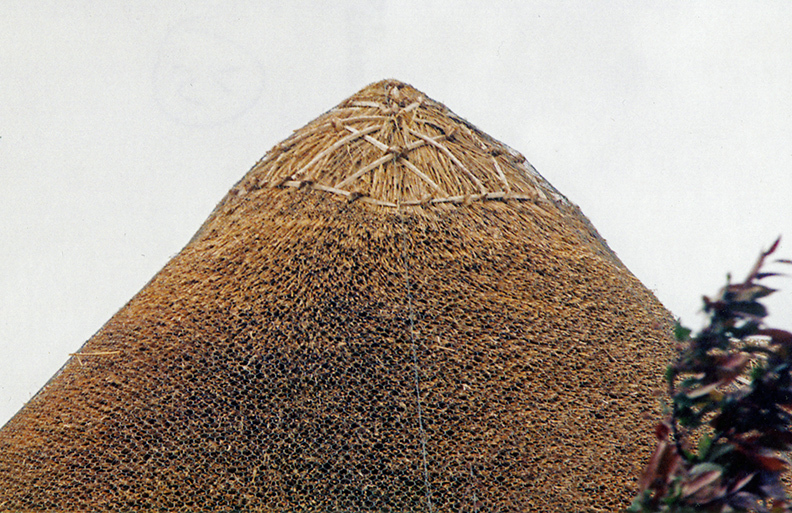 Only combed wheat reed is suitable for this method; as it relies on the stiffness of the thatch to work effectively… With any skirt in place, the thatcher takes large handfuls of wheat reed, butts the ends level and lays them with the bottom upwards; around 4 inches (100 mm) above the ridge roll; as shown opposite. 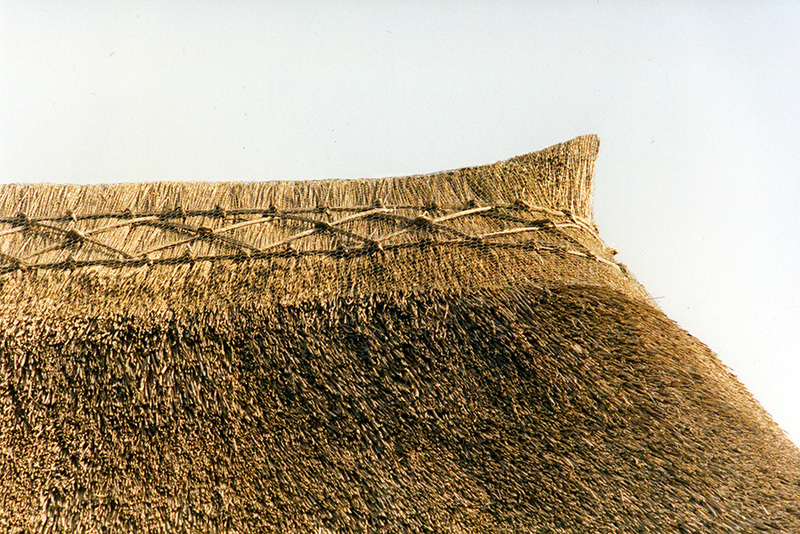 This wheat reed is held temporarily, until a section can be tapped level and a vertical face created; above the ridge roll. The opposite side of the ridge will fit against this… A correct thickness will be achieved, if a good sized wheat reed bundle covers around 3 feet (900 mm), of one side of the ridge. 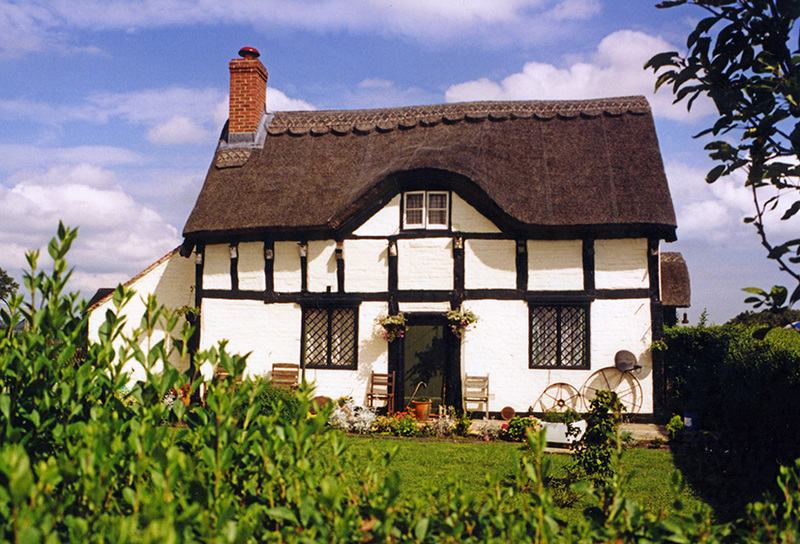 When a section is has been laid, the ridge can be sparred down to the desired design and trimmed. 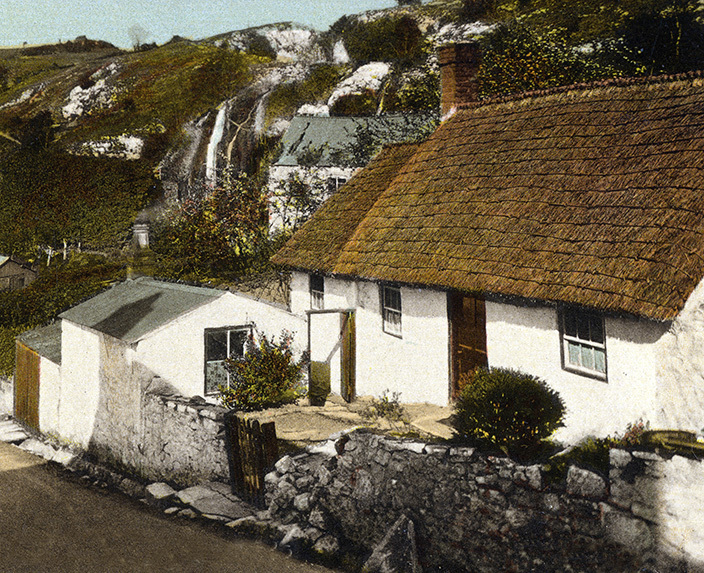 Butts up ridging… At Selworthy around 1910. 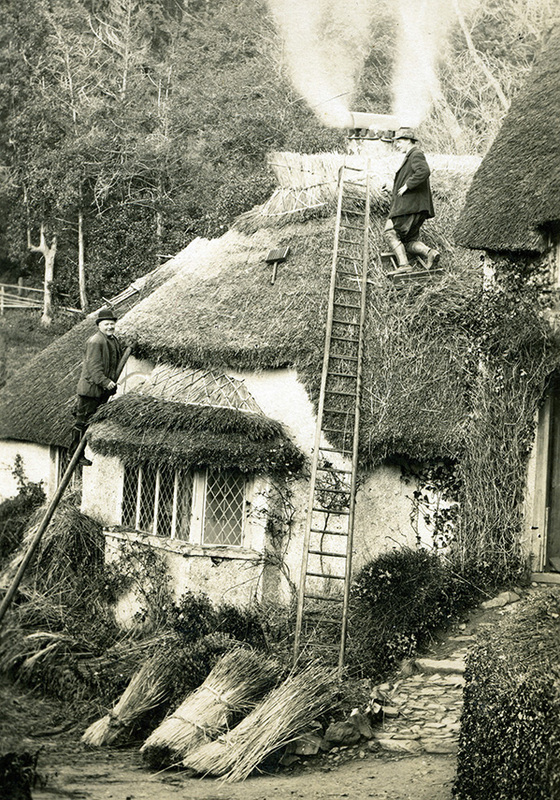 The ridging is very similar to modern work, except these Somerset chaps only used one ligger to hold down the majority of their ridging… As the image of their completed job shows. The ‘Dorset Points’ are traditionally more pronounced, in this area than in many other combed wheat reed districts. 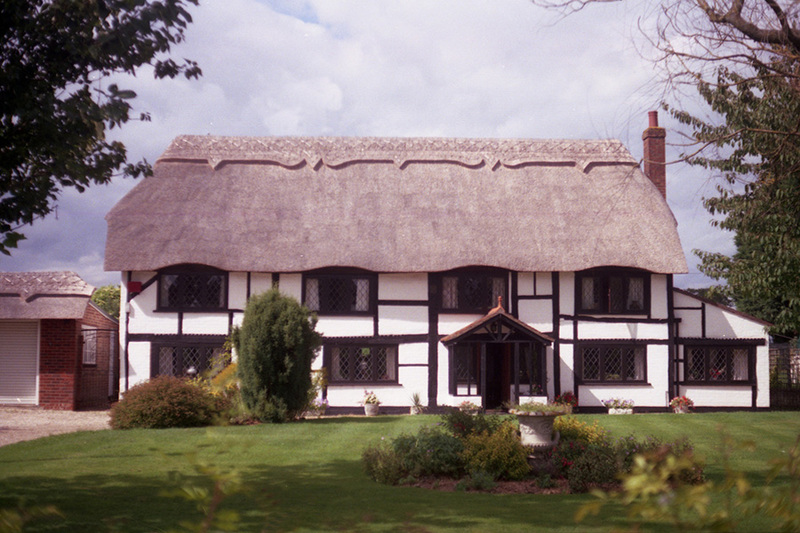 Whatever material is being used, the same procedures apply; where a ridge is needed under a window, or chimney… It is better to have laid and fixed the main ridge, on either side of the feature. So that if possible, this new section of ridge can be shaped and fixed, to form a continuous part of the main ridge. Any skirt required is fixed as normal. 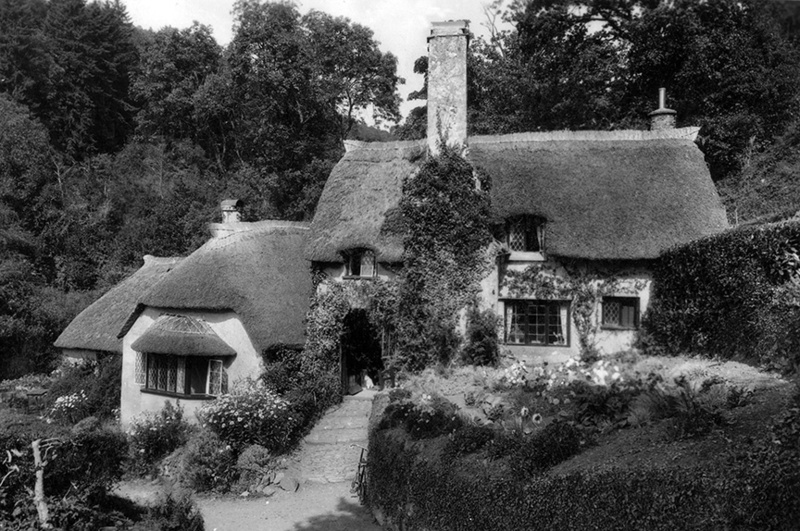 This is followed by filling the remaining area, with knuckled up handfuls of thatch; up against the chimney or window bottom, until it reaches the correct level… Extra life is often given to these areas of ridge, by the use of decent sized mortar or lead fillets and aprons… As these areas receive a lot of wear, great care should be taken, when fixing the ridge into place with spars… They should be as uphill as possible. 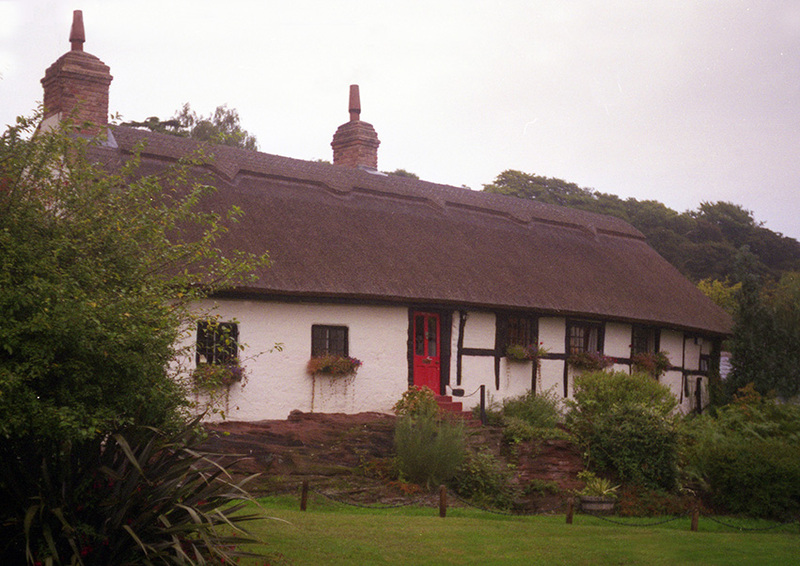 If a job has a leak, it is nearly always caused by a spar drawing water in around a chimney… In fact it is good practice that all spars on a ridge, away from the very top; are driven to shed water and not attract it. 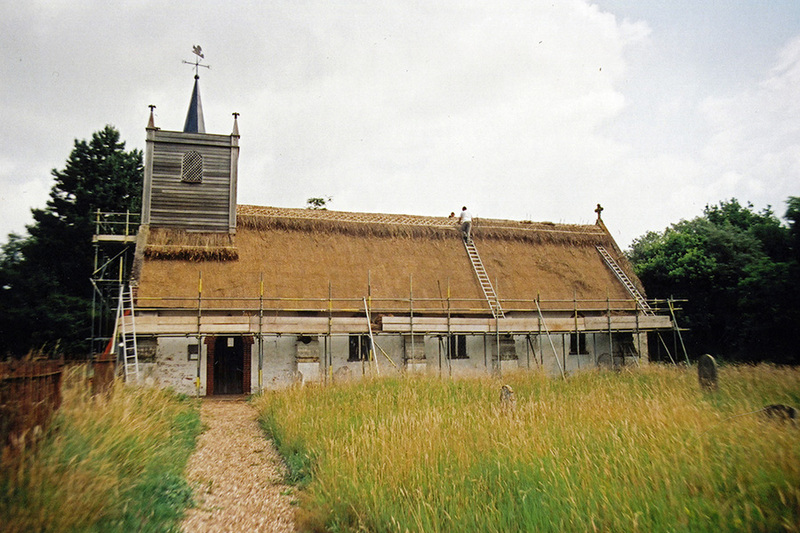 Knuckling up… A long new roof and ridge for the Norfolk church of St Mary’s, at Sisland. 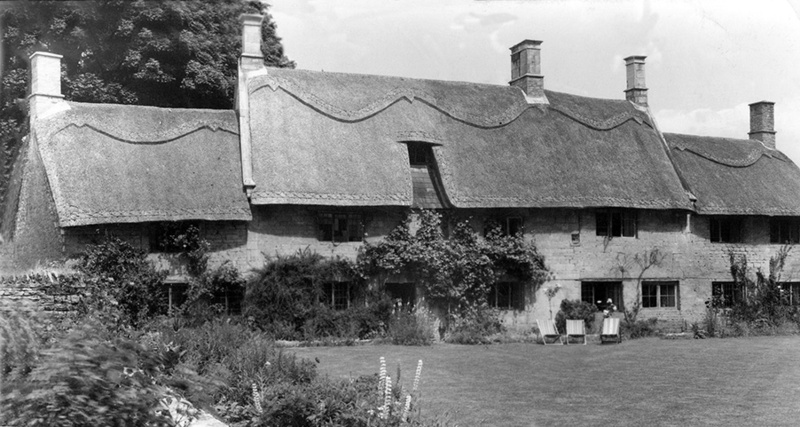 The main roof is topped by a wrap over straight block ridge; in sedge grass. Which is in the process of being ‘cross sparred’. Under the tower however the sedge has been knuckled up tight to the tower boarding. Timber old and new… Timber boarding makes a quick and easy ridging material, but seems to have always been confined to use in Southern Scotland. 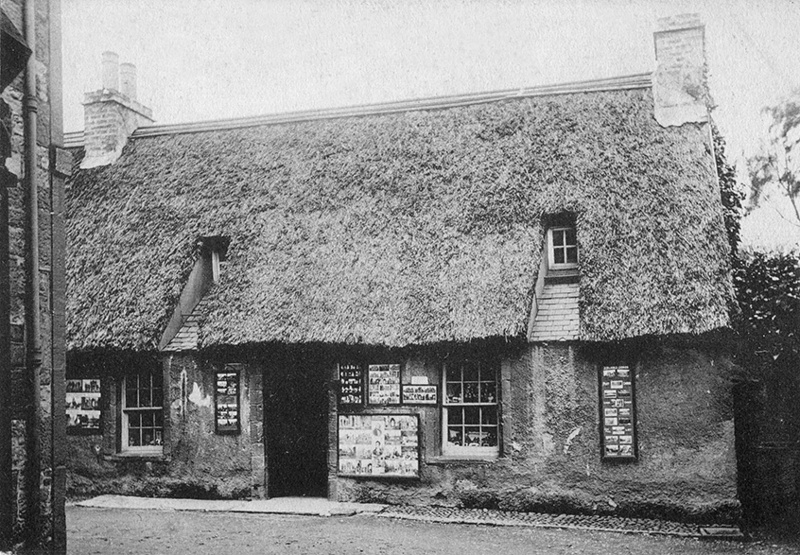 The old top image, shows a long gone roof, at Melrose in Roxburghshire. 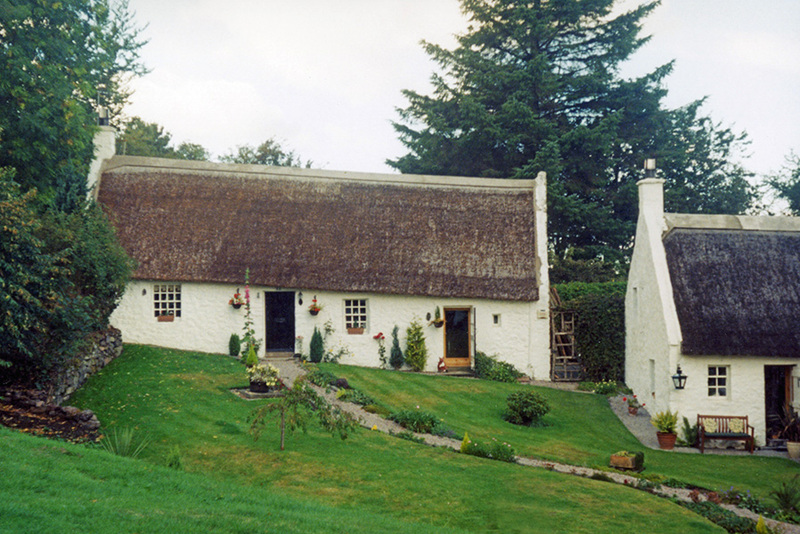 The well known thatch, at Kirkoswold, in Ayrshire, is below. Both have a wooden ridge, consisting of three overlapping boards, on each elevation. 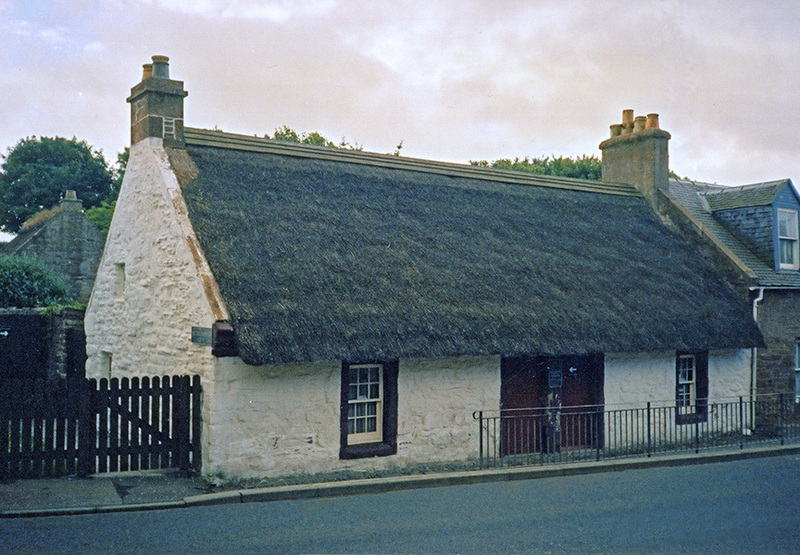 A simple and low maintenance finish, to their thatch coatwork… The lower cottage, was built in 1786 by a friend of Robert Burns. 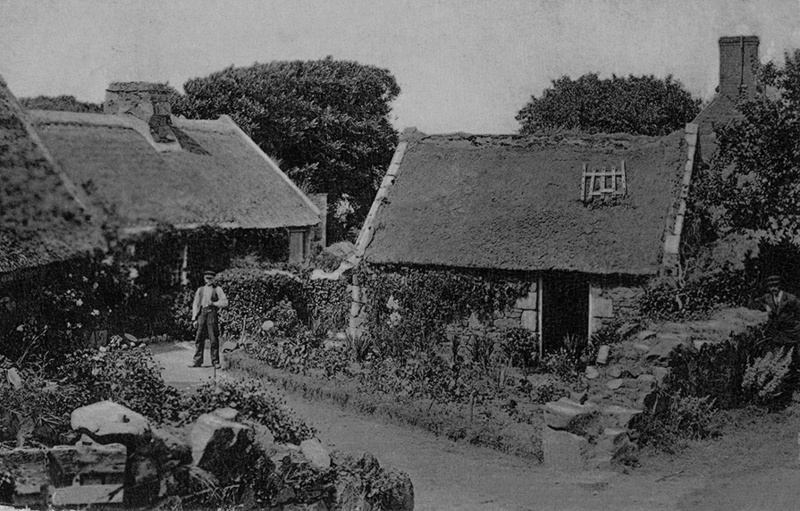 The ‘Souter Johnnie’ of his famous poem ‘Tam o’Shanter. 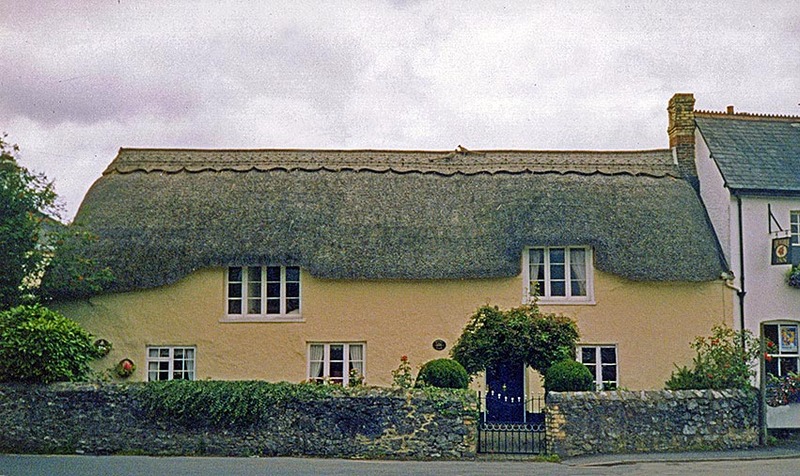 Timber, tile and mortar ridges… The working methods.